Over the course of Teespring history, sellers have donated over $4,000,000 to fundraisers, relief efforts, charities, and movements worldwide. Our community of creators possesses a unique talent in that they can turn good ideas into powerful businesses and brands—and many have chosen to share some of the fruits of their labors back to causes close to their hearts. Any listings that donate a portion of their profits will feature a verified contribution badge. This badge reassures buyers their purchase will benefit the indicated charity. Conversion rates for verified listings are 45% higher than non-verified fundraising listings. 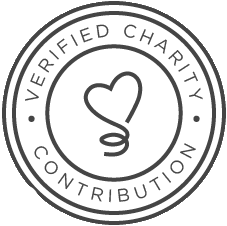 Please keep in mind only verified and certified non-profit organizations are eligible to be the recipient of the “Verified Charity Contribution” badge. In the US, qualified 501c3 charity groups or non-profit organization can be considered for the badge. Tip: When promoting your listing, be sure to let potential buyers know that a portion of your profits will directly support the cause of your choice. Sellers like Beau Bergeron and Matt Rudinksi found that their charitable listings went viral by simply mentioning where they intended to donate the profits. Hovering over the badge reveals the charity and percent being donated. Each listing’s estimated profits will reflect the amount you’ll take home, minus the amount that will be sent directly to charity. You will have both the option to view listing-specific donation amounts, as well as an all-time donation amount. This number will also include any funds raised from verified donation listings you’ve run in the past! The verified donation badge is available for US-based charities only. US-based charities will receive funds in the form of a check processed through bill.com. Once your listing’s print cycle ends, you will be able to cash out your profit as usual. Your donation will be sent automatically to the charity you’ve chosen. Please note that Teespring simply facilitates the processing of the donated profits to the intended charitable organizations. As such, Teespring is required by the United States Internal Revenue Service to report donated profits on the creators’ annual Form 1099. For more information about filing taxes in the US, please see “Filing Taxes (US)”.